In less than twenty four hours, I have walked into TWO spider webs. And I may have screamed both times. The first time I was with my mom, and she got worried (obviously when your daughter screams out in fear you pay attention), then I showed her what happened and she laughed at me. Thanks, mom. The second time was this morning, walking to my car, a spider had built a nice little HUGE web between my driver’s side door and another person’s passenger side door. Thankfully, I managed not to spill my coffee all over my clothes in my freak-out. I don’t know why I decided to tell that story, but it’s recent and on my mind, so there ya go. However, I do have good news – like this barbecued chicken tenders recipe from my favourite lady, Martha Stewart! The thing is – it is really, really a stretch to refer to this as a “recipe.” It’s basically: buy chicken and barbecue sauce, baste chicken with sauce, and grill. No fancy marinade, no super secret weapon homemade BBQ sauce…just simple and to the point! Side note: they only look burnt, but really they weren’t! I just took a pic of the only parts that were charred-looking. Go me. 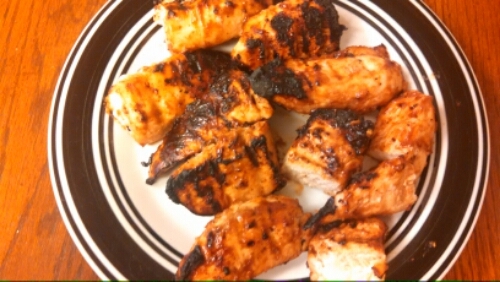 -Heat grill to medium-high; lightly oil grates. 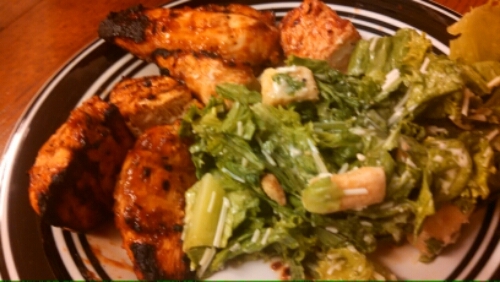 -Place chicken in a medium bowl and season with salt and pepper. Pour some of the barbecue sauce over the chicken and toss to coat it well. -Grill chicken, turning and basting occasionally with reserved basting sauce, about 8 to 10 minutes total. 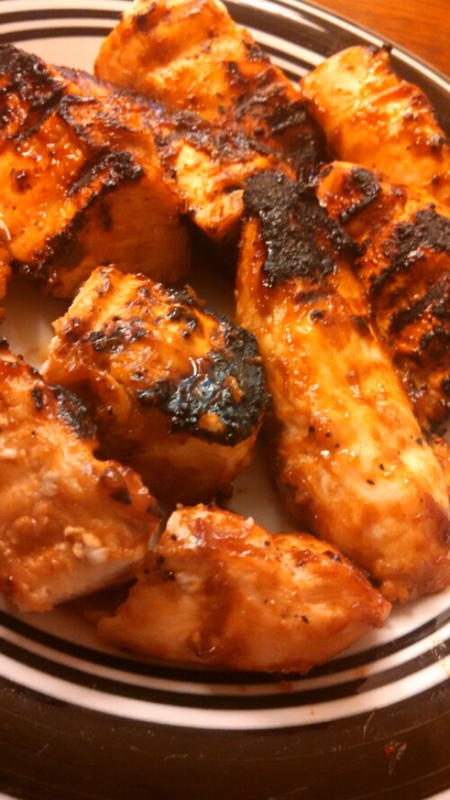 Remove chicken from grill and serve with any remaining barbecue sauce.